RecordCounter provides an overview of the number of records related to standard and custom MS CRM entities. The Add-On helps you to save time in daily business processes due to showing the number of related records already within the entity’s general view. New feature: The new product version provides the possibility to count the related notes of standard and custom entities. Furthermore, the product provides the possibility to incorporate the related regarding records in the counting procedure (meaning that it also counts the related records of entities that are associated with the initially opened CRM record). The product hence enables users to see the number of an entity's related entries at a glance and helps to save time by avoiding time-consuming clicking scenarios. Additionally, the addon provides a functionality referring to our ActivityTools addon which enables an overview of the number of activities related to the records. 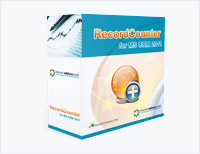 Our RecordCounter addon is very easy to install and configure. Users can quickly determine which related records should be counted via clicking checkboxes in the configuration interface.